The Adobe CC Video applications bring together today’s most popular video post-production software. Two of the blockbuster video apps are Adobe Premiere and Adobe After Effects, but with Creative Cloud, you now have licenses for Audition, SpeedGrade, Photoshop, Prelude, and Media Encoder. In this course you will go deep in Premiere and After Effects. You will also learn other Creative Cloud software tools within the post-production process. Juan Carlos is also an active Adobe Premiere Certified Associate. Classroom training in Orlando, FL. Our organized classes are a great choice for individuals. 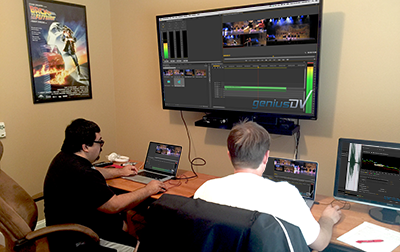 Whether you’re a seasoned editor or just starting out, our classes average only 4 students, so your instructor will be able to keep you challenged with highly personalized attention. Customized On-site Premiere/Creative Cloud Training at your studio. If you have 3 or more people that need training, it might be cost-effective to bring our consultants to you. We can customize the training to your needs, which means we can move faster and go deeper into the topics and techniques that are relevant to your workflow. Plus, we can consult you on how to structure your specific workflow to make the fullest use of the Creative Cloud tools. We can train at your location or we can host your custom class at our Orlando training facility. Our classroom is luxurious with plenty of room to create a laid back training experience. Read some testimonials about our customers’ training experiences. This class focuses mainly on Adobe Premiere-the base of your editorial workflow, but it also incorporates key workflows from all of the relevant Creative Cloud software as it pertains to Video Production. In particular, you will learn how Photoshop, Audition, SpeedGrade, and Media Encoder integrate with Adobe Premiere. It’s important to learn these applications the same way you’ll use them in the real world: all together as a comprehensive workflow. Day 1, 2: The first two days focuses on Adobe Premiere, Audition, Photoshop, and SpeedGrade, along with Media Encoder. Day 3: This is the first day of ‘introduction to After Effects‘ and it focuses on how After Effects integrates within Adobe Premiere. Prerequisites: Basic experience getting around the Mac or Windows operating system. Additional experience with video editing software will be advantageous, but is not necessary. Interface Overview: Learn the interface from the broad overview level down to those obscure but useful controls that are hiding in plain sight. Organizing: Master the skills for getting your project set up correctly. Adobe Bridge will be a useful tool in this process. Ingesting Video Content: Bring video into Premiere from anywhere: a camera, a tape, a smart phone, a tablet, media cards, or archive sources. 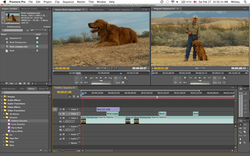 Editing: Learn how to build and refine a project using Premiere’s editing tools. Titles: Learn how to create and animate titles. This includes learning how to extrude titles into 3D space. Learning about lighting effects for titles. Audio Editing: Refine and mix audio content within Premiere. Learn how to use Adobe Audition to go even deeper into Audio editing. Using Effects: Discover how to make adjustments to your video and audio to enhance the appearance. Some of the effects you’ll learn to use are easy to spot on-screen, like blurs, glows, and lens flares. Others are more subtle, like removing video noise and changing the background of a green screen shot. Basic Animation: Learn to control attributes over time. For example, you might make a video clip move around the screen then shrink into the corner, or drop the level of the music as a narrator begins to speak. Color Correction: Fix shots, lighting problems and add color characteristics to create a specific mood. Multicam editing: Learn how to sync multiple camera angles together to be able to edit in a manner that recreates the feel of switching live. Output: Prepare your video for the world to see using the capabilities of Premiere and Media Encoder. Introduction to After Effects: Learn the critical interface windows, and how they will affect your customized workflow. Basic Animation Techniques: Learn how to create an animated title for a show. 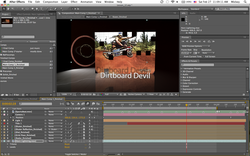 Creating an AE Composition: Learn how to set up your own compositions. This includes learning key shortcuts for navigating within the Composition and Timeline windows. You’ll also learn how to manage your work area and discover ways to preview your working animations. Parenting Skills: Learn the importance of using parenting to group individual layers. This allows you to apply effects or motion parameters to a group of layers while maintaining the individual layers themselves. Understanding Transformations: Take your animated AE elements and integrate important properties such as scale, rotating and opacity changes. Learn how to change the anchor point around which transformations occur. Working with video layers: Learn the fundamentals of working with After Effects layers. These skills including mastering the trimming techniques which include features such as splitting layers and slip edits. Manipulating time: Explore various methods using time stretching, reversing, frame blending and motion blur techniques. Using After FX Modes, Masks and Mattes: Explore how AE transfer modes work, including details on drawing, editing, and combining masks. Learn tricks on how to properly rotoscope an object, plus explore how smart mask interpolation works. Using Track Mattes: Discover the use of using track mattes within After FX, which borrow the luminance or alpha channel of a layer to define the opacity of another layer. Using Stencils and the ‘T’: Use Stencils and Silhouettes, which affect the transparency of layers with an After FX composite. We will also show you the difference between the preserve transparency, and alpha add transfer modes. Professional-strength color grading: Learn how Adobe’s SpreedGrade software functions have been integrated into the new Lumetri plugin inside of Adobe Premiere. Working with Cameras in After FX: Learn how to create, edit and animate cameras within 3D space using After Effects. You will learn how to work with the default camera, and we will demystify the numerous camera control parameters within AE. Lighting in 3D: Learn how to create, edit and manage the different lights within After FX. Discover the importance of material options and how they react with different types of lights. Parenting Skills within AE: Master the use of parenting to group individual After Effects layers. This allows you to apply an effect or motion parameter to a group of layers, while maintaining the effects within the individual layers themselves. Nesting and Precomposing Compositions: Discover why it is critical to build advanced effects using multiple compositions. This will allow you to manage incredibly complicated effects structures with the ability to make changes. Collapsing Transformations with After FX: Learn an incredibly useful approach to maximizing image quality in a chain of composites, and why that process differs when compositions are made of 3D layers. Importing and Outputting from After Effects: Preserve maximum quality and flexibility as you bring various media types into and out of After FX. Wrap Up: Take time to review important concepts that were covered in previous modules. The Instructor will review critical concepts and give everyone in the class time to finish any uncompleted exercises.